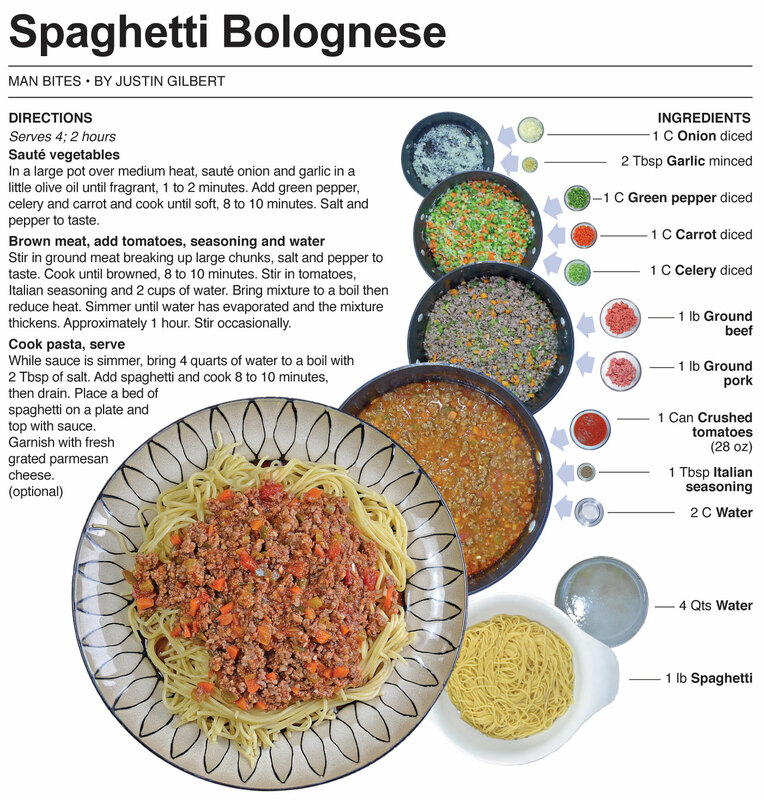 My Aunt makes a sauce known in our family as “meaty spaghetti sauce.” It’s base is ground beef and goes on pasta – just as the name suggests. 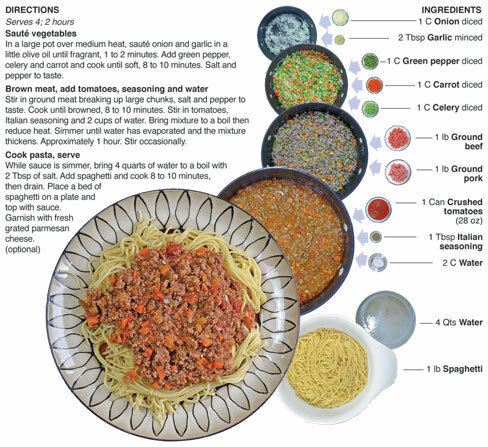 In the culinary world it’s actually known as a ragu or bolognese (pronounced boh-loh-NYEH-zeh) sauce which is based on ground or minced meat and contains root vegetables like onion, celery, carrot and garlic. It is also common to include tomatoes, peppers, cream, broth and herbs for seasoning. It’s all cooked down into a thick and rich sauce made delicious from a long simmer. 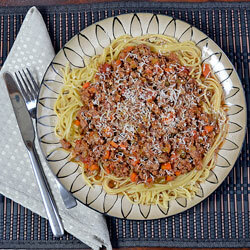 The sauce originated in Bologna region of Italy and is known throughout the world as bolognese. The irony is that in Bologna the sauce is not called bolognese, instead it’s called ragu – which is what bolognese really is. In other words, bolognese is a ragu from Bolgna! Food says so much about people, in a way, it is an extension of our creativity. My 11 year-old niece has been making salads for a couple of years now and they always turn out looking like an elementary school art project, which is no surprise because hat is her favorite subject at school. The meaty spaghetti sauce my aunt makes is not only good but it’s very much my aunt. I told her that it was really called bolognese and she said “I don’t care what it’s called, I like my spaghetti sauce really meaty and that’s what it is to me.” Forget the technical stuff. That’s what she likes and that’s what matters. Her meaty spaghetti sauce is my spaghetti bolognese. Honyocks, zany little critters and meaty spaghetti sauce – little things that will always remind me of my Aunt Roxie. I recently discovered a new brand at the grocery store called Curly’s. 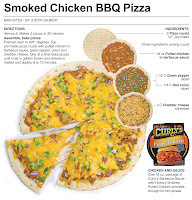 They make a variety of smoked meat products including beef, pork and chicken that have been pulled (rather than shredded) and mixed with their own barbecue sauce. The company has been a food supplier since 1988 and have built a reputation for quality pit smoked barbecue. 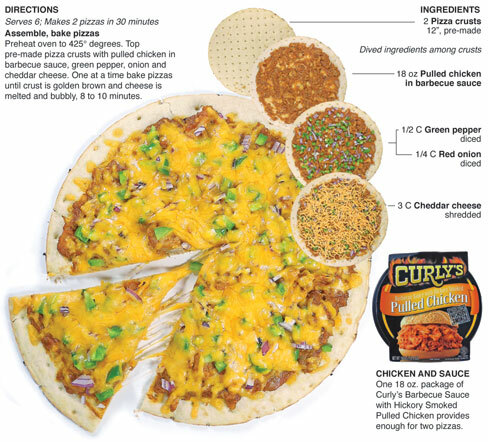 I generally don’t like products like this and prefer the challenge of making it on my own, but I gave Curly’s chicken a try recently and I was impressed. The chicken had great smoky flavor and the sauce was better than most found on store shelves. I’m sure it would be great in a sandwich, but as soon as I saw it in the meat cooler I knew it was destined for another purpose. 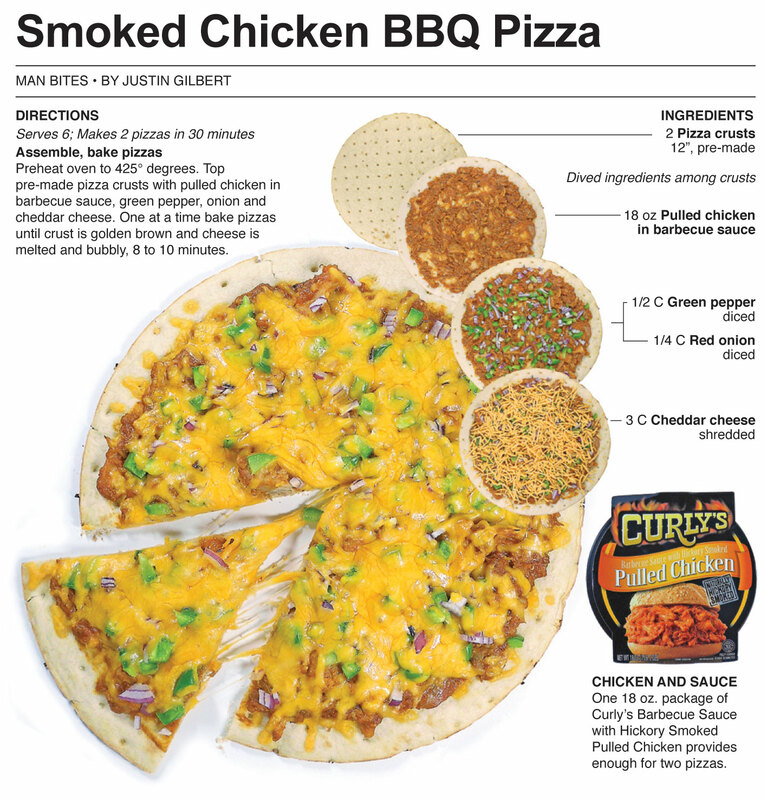 For this recipe, I use Curly’s Barbecue Sauce with Hickory Smoked Pulled Chicken as the meat and sauce of a gourmet pizza. Considering the amount of time it would take to make the smoked chicken from scratch, Curly’s is well worth a try and the results are delicious. I usually don’t get to cook on charcoal until much later in the spring, but this year mother nature brought us a record-breaking heat wave for the opening weekend of the NCAA basketball tournament. It was a small slice of heaven for me because I am a sports nut and a grill master. I watched hours of fierce competition and grilled pound after pound of animal flesh. The only thing that could have made the weekend better was if the Miller Brewing Company would have sent me a truck full of free Miller Lite. One of the items I made on the grill this weekend was smoked chicken. It is inspired by Curly’s. 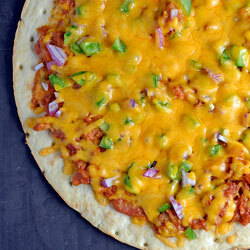 I want my own version of smoked pulled chicken in BBQ sauce to put on pizzas or stuff into sandwiches. The smoked chicken I made on the grill was rich in smoke flavor but a little over cooked - or at least a little dryer than what I usually like it. Next time I’ll get it just right - Then I’ll start on the BBQ sauce to smother it in. 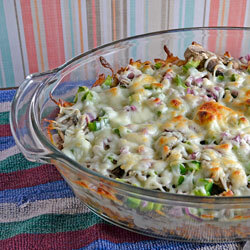 Look for the recipe here soon. In Ireland, St. Patrick’s Day is a religious holiday. The tradition was brought to America with mass immigrations of the Irish in the 19th century. Over the last 150 years, the American version of the celebration has moved from the church to the streets – complete with leprechauns guarding pots of gold, green beer and corned beef and cabbage – all St. Patrick’s Day traditions part of the American version of the holiday. In 19th century Ireland, corned beef was rarely eaten, and was produced mainly for export to England. It is believed that Irish immigrants in the U.S. started eating it on St. Patrick’s Day as a symbol of their newly found status and it eventually evolved into the traditional holiday dish. Corned beef and cabbage is to Ireland like Taco Bell is to Mexico – more American than authentic cuisine. 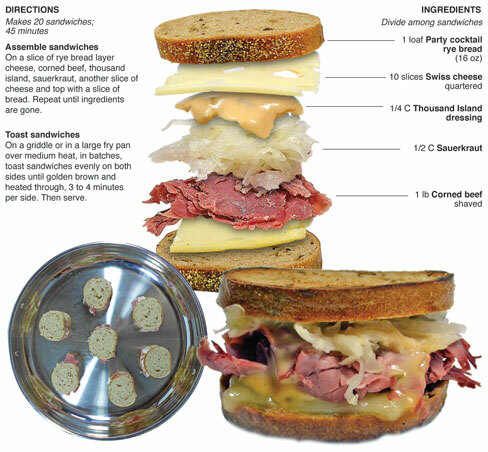 For this recipe, I use corned beef and fermented cabbage, otherwise known as sauerkraut, in a mini reuben sandwich – The perfect snack for an American St. Patrick’s Day party or celebration. 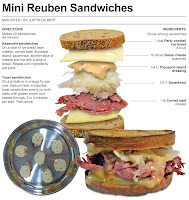 In 1956, Fern Snider, a cook at the Blackstone Hotel in Omaha, Nebraska, won the first National Sandwich Idea Contest with the reuben sandwich, giving it national recognition. 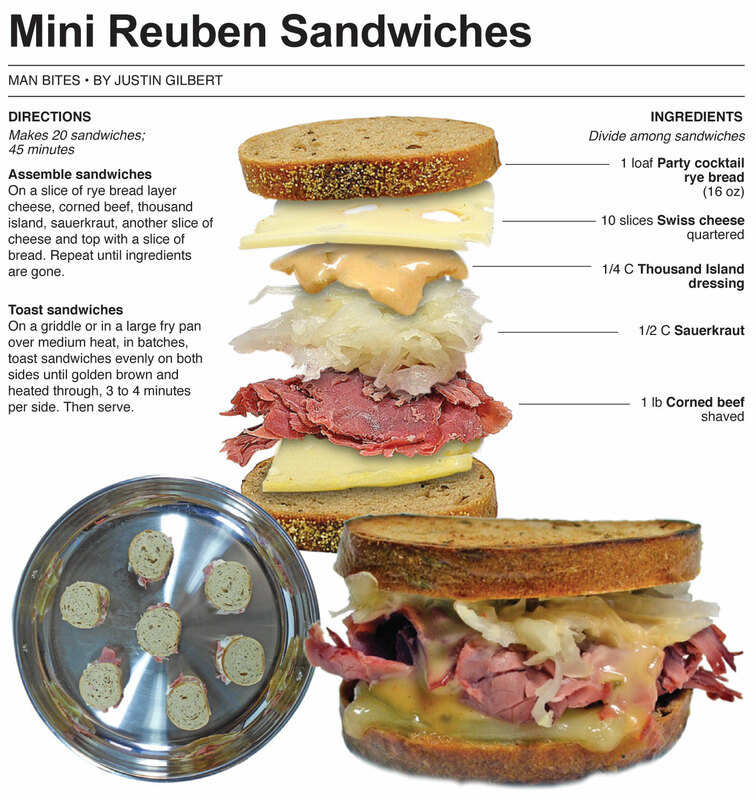 Today, reubens can be found on menus all across the U.S., and is truly a great American sandwich. I put it in the same category as the Big Mac and Philly Cheese Steak. Arby's has a Reuben as a temporary menu item that I tried last Friday night. It was good, except I got the "Super Reuben" which included sliced turkey as well as corned beef. This took away from the overall experience because when I order a reuben – I'm expecting a reuben. I should have just gotten the regular version. After I left Arby's I went directly to Meijer to explore the grocery section hoping to find inspiration for my weekly food column that was due four days later. I was there a total of ten minutes when I came across a display of cocktail party breads. At first I thought "bruschetta." As I looked at the various packages of different breads I noticed rye. That is when it hit me. 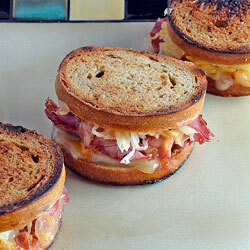 I had to take these mini slices of rye bread and make me some mini reubens! It's lots of work making 20 small sandwiches, but the end result was a tasty little snack. It was a complete coincidence that corned beef and sauerkraut (fermented cabbage) are the center piece for this treat. It's the perfect recipe for a St. Patrick's Day column and made for an easy introduction. 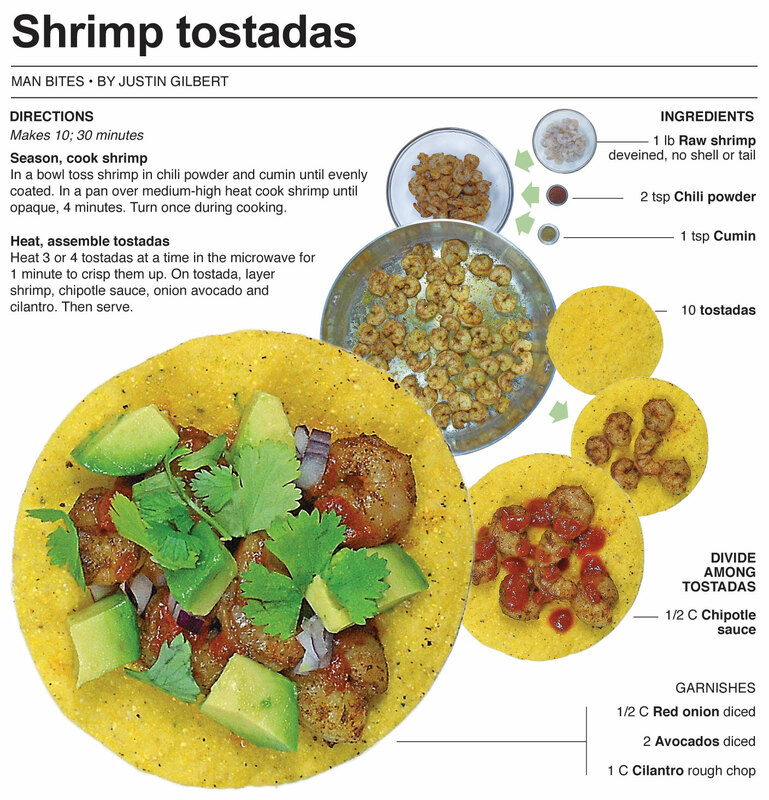 Try these this weekend - They're the ultimate snack to wash down with green beer! I have learned to accept that I can’t eat as much yummy seafood here in Indiana as I did when I lived in New York City. It’s just a matter of being landlocked. Not that I can’t get quality seafood here, it’s just that it comes a steep price. Gone are the days of visiting the fish monger across the street and taking home a bounty that was pulled from the sea just hours before. One seafood item that I get good results from consistently in Indiana is frozen raw shrimp. It’s cleaned and flash frozen on the boat just after being pulled from the sea and usually keeps well as long as it remains frozen solid until it is thawed just before cooking. I love shrimp, but it is delicate and must be cooked just right. I tend to lean on the side of rare with it. My philosophy with shrimp is don't be afraid to pull it from the heat to soon, kind of the opposite of chicken. Overcooked shrimp is rubbery and just plain nasty, where as shrimp cooked barely through is juicy and succulent. 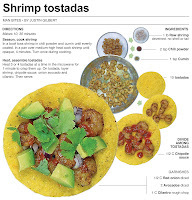 For the tostadas here I season the shrimp similar to how I would season ground beef for nachos or tacos, with chili powder and cumin to give it that south of the border flavor. 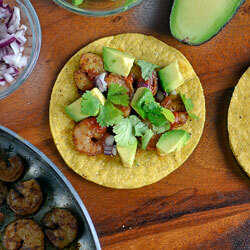 I also use a sauce on these tacos that’s worth mentioning. 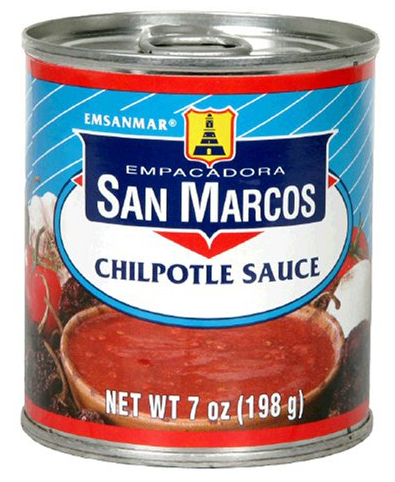 It’s simply named Chipotle Sauce and it’s made by Empacadora San Marcos. The only major grocer that carries it in Fort Wayne is Meijer. It’s tomato based, and because of the chipotle, or smoked jalapeño, it has great kick with a smoky flavor. It reminds me of the red sauce I used get at taco stands in Queens. 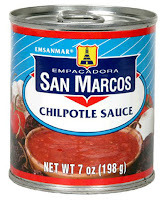 I always keep a can or two in the pantry so I can have quick authentic Mexican flavor when I need it. 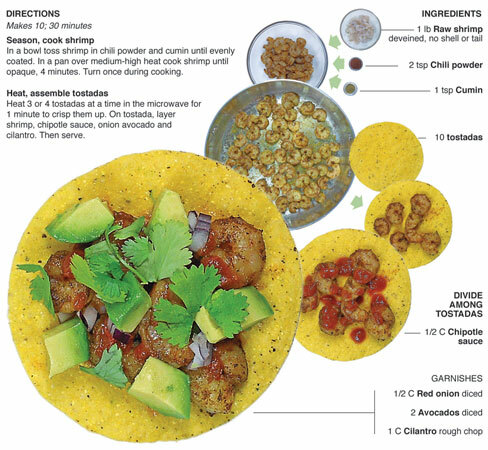 When I sat down to create the graphic recipe I was mortified to find out I had neglected to photograph the onion step for building the tostada. I couldn’t believe it! 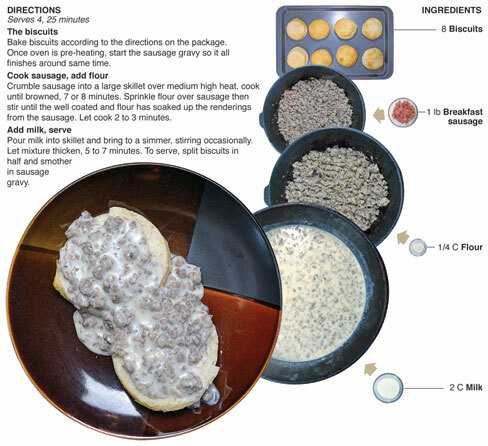 Because of this, the recipe was ruled out for print. You’ll notice that I overcame the blunder by using one photograph to illustrate all the garnishes. Usually each would get its own photograph. 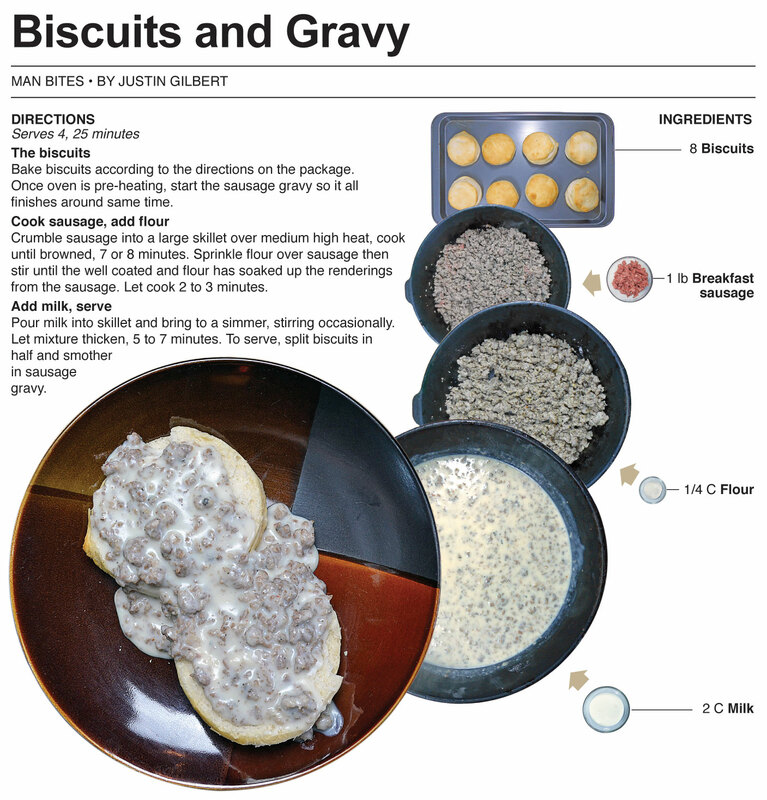 It works just fine that way but I have established a style for illustrating these recipes. Although every single step and prepped ingredient isn’t always necessary to photograph, I try to remain consistent and include everything. 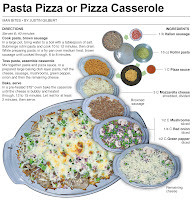 I believe doing that is what makes these recipes stand out and it does help to simplify the cooking process. I’m the only one in the world that would notice that, but it was the primary reason why this recipe will only appear here on the blog and not in my newspaper column. Last week we had our first glimpse of spring. I took my dog on a walk in cargo shorts and a T-shirt – my official warm weather uniform. I inspected the gas grill to make sure it would be ready for the copious amounts of meat that will be cooked on it in the coming months. I was thinking about the garden, getting a new bicycle and possibly creating a nice spot in the yard for a fire pit. Then came the weekend with 60 mph winds, snow and a brutal reminder that it’s March in Northern Indiana. The up and down climate is like standing between two rooms and I’m not sure which one I should be in. 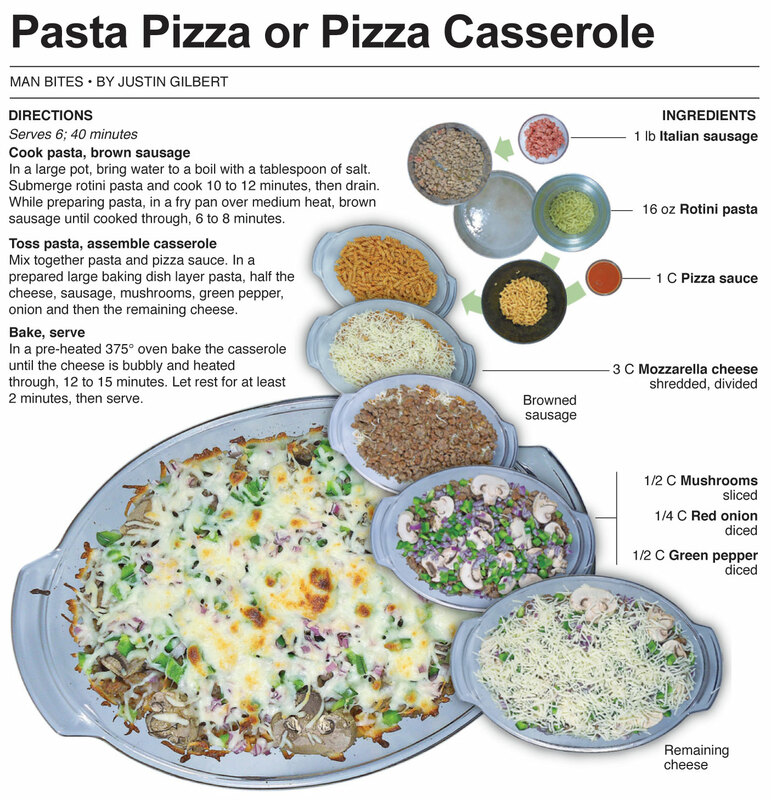 I created this recipe with the intention of calling it a casserole, and believe that is really what it is - I brought up the pasta pizza thing just to stitch in the winter/spring weather thing for the newspaper version of the column. As I mentioned above, the weather is just crazy this time of year in Northern Indiana. Today it was in the 60s and yesterday and the day before the high was in the 30s. On warm days you think about what you’re going to grill and what improvements you can make to the landscaping in the yard. Then in a matter of hours the snow is flying and you’re stuck inside making comfort food and breathing the carbon exhaust emitted from the gas fireplace. I think this weather is more conducive to making people sick than the freezing cold of January and February. Warm days followed by below freezing is hard on the body. I will say this – I CANT WAIT FOR SUMMER! These nice days are teasing me. I can’t wait to open my camper at our family campground and throw a chunk of meat in my brick smoker. Warm days are on the way! With the warm weather I can move much of my cooking outside and start using the grill extensively. 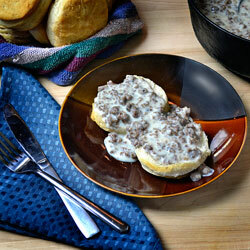 I’m hoping that this is one of the last few comfort dishes I will be cooking as we transition into spring. 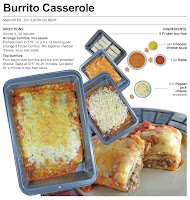 I used to eat frozen burritos like they were going out of style when I was in college. They can be eaten on the run or smothered in salsa and cheese and gobbled up while watching the news. 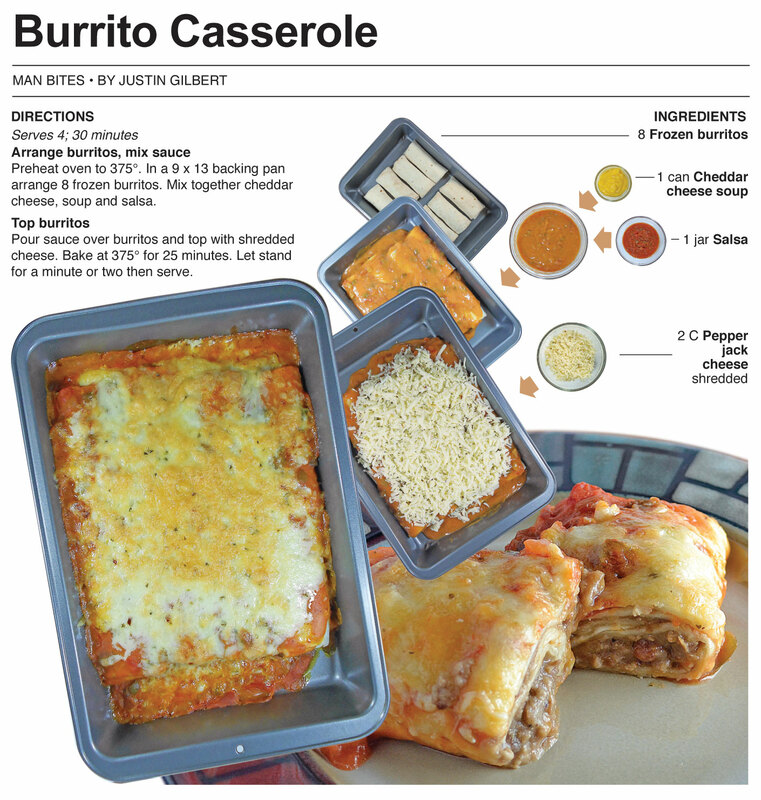 I was browsing through the freezer isle at Meijer and came across the frozen burrito section – I was instantly transported back to my college days. I knew I had to buy a package and come up with something simple. 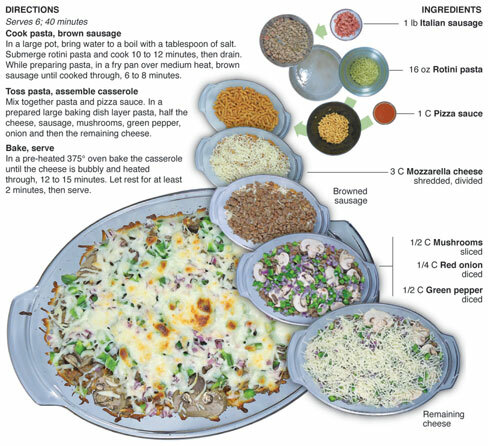 I put the entire package of eight frozen burritos in a baking pan, mixed together a can of cheddar cheese soup and a jar of salsa for a sauce and topped it off with pepper jack cheese. 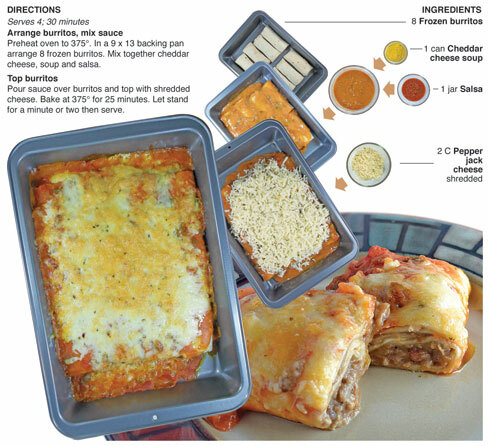 I shredded the cheese myself from an 8 ounce block because it seems to melt better than packaged shredded cheese. The end result was a surprisingly tasty dinner that takes about thirty minutes to make. 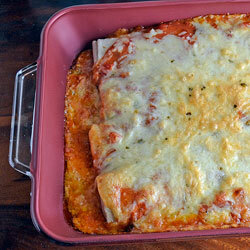 This is the sixth recipe in my series of weeknight bites. Each time I go to the store, I see something new that inspires another recipe. I’m going to have to stop looking for a few days because I have enough stuff in the freezer now to make 3 or 4 recipes. I must discipline myself to empty my reserves before I go back to the new-found culinary gold mine known as the freezer isle.